On Halloween night in 2014, three girls were killed in a hit and run crash while trick or treating in Santa Ana, CA. Two of the girls were twins. I remember hearing the news on my way to work that night. I actually closed my eyes and shook my head when I heard about the twins. How awful for a family to lose two daughters in one crash. It gave me an ache inside that three kids were killed about the same time I was trick or treating with my kids. As a father I couldn’t imagine what the families were going through. As a collision investigator I was glad I wasn’t the one who had to handle that call. A few days later my partner sent me a picture from a news story about the suspect being arrested for the Santa Ana hit and run. The person in the photo was Jaquinn Bell. I knew who he was because I met him in August of that same year. He had crashed while DUI in my city with his two kids in the car. During our conversation that night he denied crashing. He also told me he parked his car, but didn’t know where it was. I repeated back to him some of the things he said because he sounded silly. At one point he said, “You’re making me sound irresponsible.” Nope. He was doing that all by himself. On the night we met him he tried hiding between two houses, but was seen by witnesses and officers. He was actually on the phone with his dad at the time as he told his kids to get down when the officers arrived. He showed everyone how irresponsible he really was that night. He also showed it again on October 31st. 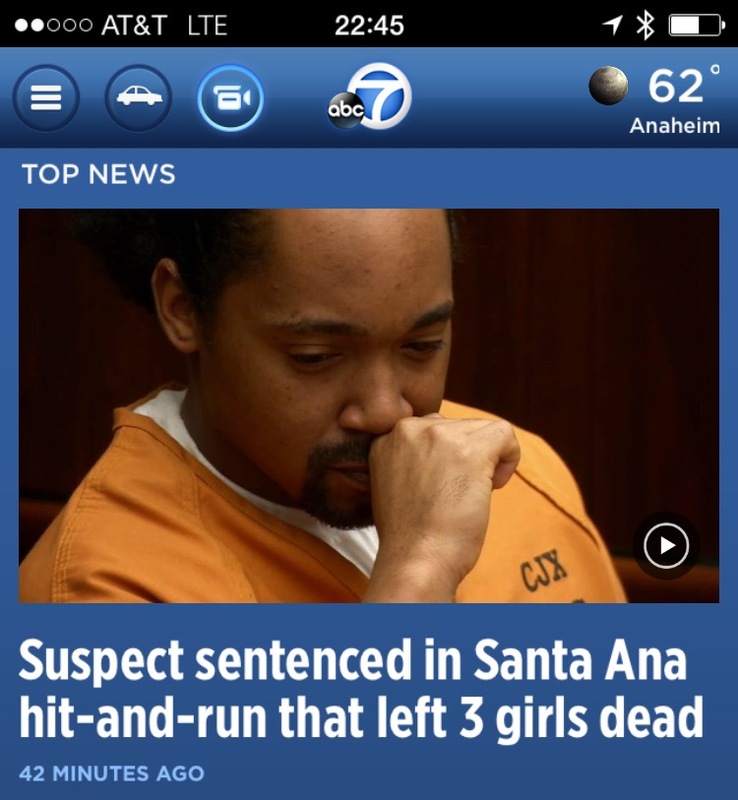 The other day he was sentenced to 15 years in prison for the collision in Santa Ana. The time he’ll spend in prison won’t bring back those girls, but at least he won’t be able to hurt anyone else for a long time. That’s the only positive thing from this story. In closing, I have one thing to say to you Mr. Bell. I hope you see those bodies when you close your eyes at night. I also hope it haunts you for the rest of your life. You had no right to take those girls away from their parents. This entry was posted in Stories from work and tagged drunk driving, dui, jaquinn bell, police blog, police stories, santa ana hit and run, traffic collision by Badge415. Bookmark the permalink. Gut-wrenching to hear this story, and the many others like it that occur daily. We have a serious problem in this country with the ideas of accountability and self-responsibility. Too bad we can’t get people to stop drinking and driving or taking drugs and driving. I remember this when it happened. 15 years just isn’t enough for what he did. I knew he had priors but didn’t know he had kids with him then too. I couldn’t imagine any father would risk his children’s lives repeatedly driving drunk. Yes, very bad indeed. It’s terrible those kids had to witness that crash and know what their father did.